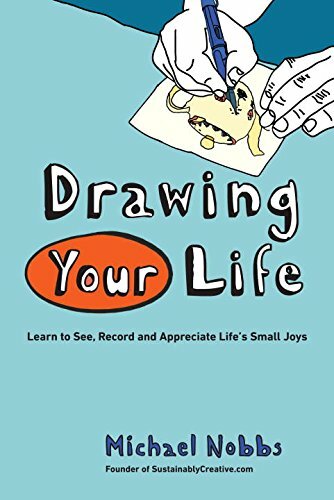 Drawing Your Life by Michael Nobbs is a fun book for those trying to pick up the sketching habit. It's also an inspiring book that wants you to capture and draw everything that you see in life. It advises you to draw things that you won't normally notice in life, such as the condiments or people in a cafe. And by doing so, you'll get a deeper appreciation of things in life, and even find more meaning in the things you see. I know this to be true because I like to draw what I see too. The book is about observational drawing. While those who don't have any drawing skills may find it a bit more difficult to get started, it's still a very fun activity book to get you to draw something. Don't worry about how your drawing looks and just enjoy the process. With practice, you'll only get better. The book's a 208 page paperback just slightly smaller than A5 size. One each page are simple instructions and tasks you can follow to create a drawing daily. It's easy to follow along, and by the end of the book you should be able to look back and see how far you've come in terms of drawing. It's a book you can flip to any page and draw. Each task should just take a few minutes. After you finish the book, you can get your own sketchbook and fill it up using the same tips again. In some ways, the book reminded me of Danny Gregory's Everyday Matter. Both books are inspiring and are highly recommended.